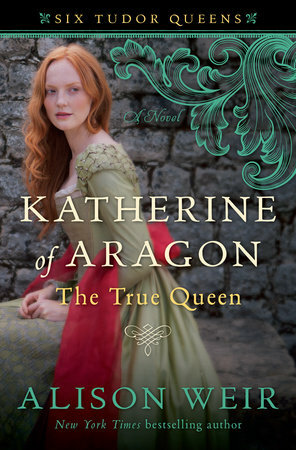 Katherine of Aragon: The True Queen is the first book in Alison Weir’s new historical fiction series that will cover each wife of Henry VIII. THE PLOT: The Spanish Infanta Katherine has traveled to England to become the bride of Arthur, Prince of Wales. Arthur is the oldest son of Henry VII, the first Tudor monarch, and her marriage and future son will help secure the Tudors on the throne. But Arthur is a sickly boy, and his death puts Katherine in an awkward position; stuck in England with no money except her dowry, which she begins to siphon off just to pay for food for herself and her servants. She is betrothed to Arthur’s younger brother, Henry, under the assumption that her marriage to Arthur was never consummated, but there are no guarantees that this marriage will take place. Upon the king’s death, Katherine is finally married to Henry, now King Henry VIII, and it appears to be a true love match. Henry is young, handsome, and all too willing to produce an heir. Unfortunately, none of Katherine’s many pregnancies result in a live son. Babies are born dead, miscarried, or live only a few months. Only a princess, Mary, survives and thrives. Katherine begins to worry that their marriage is cursed, perhaps because Elizabeth of York’s male cousin was executed before Katherine’s parents would allow her to marry Arthur. Henry stands by Katherine until she is no longer able to bear children; then he claims their marriage is invalid because Katherine was first married to his brother. It’s a bit longer before Katherine realizes Henry is desperate to take a new wife, and not just to get a male heir. The influence of Anne Boleyn will cause Henry to alter the course of history. MY TWO CENTS: You may be wondering what sets this book apart from all the other Tudor fiction out there. First, it’s written by acclaimed historian Alison Weir, which means she’s very well versed in what is fact versus what is fiction. Because this is historical fiction, she’s taken some liberties with letters and the timeline; but you know she made those choices deliberately and not out of ignorance. Second, this book is told in third person limited from Katherine’s point of view. If you are familiar with Tudor history, you’ll be aware of things going on behind the scenes that Katherine, as our narrator, doesn’t know. For example, it’s a long while before she realizes that Henry VII isn’t to be trusted. The reader realizes that Henry VIII has started cheating on her way before Katherine does. Even as the reader realizes that first Mary Boleyn and then Anne Boleyn have surely entered the picture, Katherine remains blissfully ignorant. Finally, Katherine remains convinced until very, very late that Henry will ultimately give up Anne, reconcile with the church, and come back to her. The reader feels sorry for Katherine, knowing that she won’t ever get so much as a kind word from Henry ever again. But at the same time, the reader must admire Katherine’s resilience. First she lives through the horrible poverty between Arthur’s death and Henry VII’s. Then, when faced with her dissolving marriage, she remains absolutely certain of its validity. Even when momentarily tempted to take the easy way out, she remembers that she must stay strong to secure her daughter’s position. I don’t always love Weir’s fiction writing style. For example, characters “wept afresh” a little too often for my taste. But it’s certainly not as awkward as Weir’s “Captive Queen.” You can lose yourself in the story and the history. BOTTOM LINE: A long book, and well worth the read; offers a unique perspective entirely from Katherine’s point of view. If you know Tudor history, you’re filling in the other angles of the story while reading what’s presented. I’m very much looking forward to other works in this series. ON SALE DATE: Available May 31, 2016, in hardcover and eformats. NEXT UP IN THE SERIES: I hope we in the US get these novellas: Arthur, Prince of the Roses, coming in November 2016, and The Blackened Heart, a bridge story between Katherine and Anne Boleyn, coming in March 2017. Anne Boleyn’s book will probably come spring/summer 2017.